This is the right-hand sheet of a Hokushū triptych. 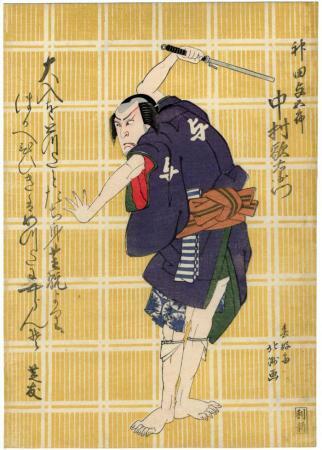 This print helps commemorate a performance at the Naka Theater on the 13th day of the 3rd month of 1822. Quoted from: Masterful Illusions: Japanese Prints in the Anne van Biema Collection, p. 148. The character 'yo' (与) which appears on this actor's jacket is shorthand for the role he is playing. 1) In black and white on page 40 of Stars from the Stage in Osaka: Early 19th-century Japanese Kabuki Prints by Matthi Forrer. 3) This print along with the left primt in color in< i>Masterful Illusions: Japanese Prints in the Anne van Biema Collection, p. 149.